Every year, millions of words are written about leadership while thousands of workshops, seminars and motivational speeches are dedicated to the subject. The link between leadership and creativity is fascinating. Sometimes I am called in to these seminars to talk about creativity and imagination in leadership, though usually I am an afterthought. Imagination doesn’t rank highly in the minds of leadership trainers – perhaps because they don’t have a lot of it. Much of the leadership training I have witnessed is little more than getting people to jump through hoops. It seems to me that very few books and none of the presentations I have witnessed go to the heart of leadership and deal with its single most important element –VISION. To treat with the mechanics of leadership without attending to its central core is like describing a person purely by their bodily functions without reference to their mind or emotions or the passion that fills their heart. 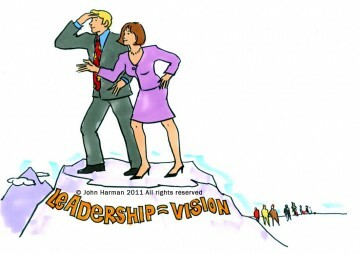 All great leaders have vision. That’s why it’s so easy to talk of leadership in terms of the military. No one is suggesting that winning battles is easy: it’s hard to induce an enemy to fight you in a way that will guarantee his defeat. But a commander’s strategic vision is always the decisive factor. Similarly, with management turnarounds. Which of us has not heard of a sick corporation transformed by a new, visionary CEO, or of a dysfunctional, underachieving high school regenerated within a few years by the arrival of a new head teacher with vision? Successful battles and corporate transformations are always a function of vision. So how easy is it for junior and middle managers to exercise leadership? Frankly, it isn’t – not when set methods and prescribed procedures and goals are in place. Which is why so much of the received wisdom about leadership, as well as the leadership training I have been part of, is less about real leadership and more to do with decisiveness and good human relations and basic management skills. Vision born of the imagination enables a leader to see his or her goal in all its crystal-clear brilliance; to see every facet of it, to see, as if on a big screen, the route to attaining it and the pitfalls along the way. And when a leader transmits that exact vision into the hearts and minds of his or her people – then battles are won, corporations transformed and departments revitalised. Which brings us to creativity. To have imagination a manager must be able to exercise creativity. It is the sine qua non of leadership. Leaders understand this: they know the importance of thinking outside the box… first of all, they know what the ‘box’ is… they know how vital it is to ‘see with the mind’s eye’; know the importance of ‘playing’ with concepts, of thinking intuitively, of knowing when to brainstorm a problem and when to incubate it. Which makes it even more curious why real creativity is often considered irrelevant – or even subversive – when it turns out to be the raw material of leadership. In today’s more democratic workplace, creativity is even more important. As Margaret Mead said: ‘Never doubt that a small group of thoughtful, committed people can change the world. Indeed, it is the only thing that ever has’. Without creativity the imagination is barren and paralysed. And without imagination there is no vision. And where there is no vision… but that’s where I came in.